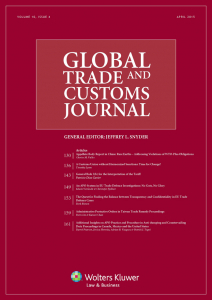 The Global Trade and Customs Journal (GTCJ) is celebrating its 10th year of publication. In its first decade, the Journal focused its work on the issues facing international business and the day-to-day challenges facing practitioners. It aims to provide its readers with new ideas, fresh insights and expert views on critical practical issues affecting international trade, with a growing focus on international investment regulation. In 2015, the old clichés still hold true. The world is getting smaller and time flies. Globalization is driving businesses to be better, smarter and faster. To do more with less, and to do it safely, complicates compliance. Yet despite the pace and power of globalization, national borders are not fading away. In fact, national borders have strengthened and national measures are multiplying. International business faces an array of obstacles to compliance which are exacerbated by preferential trading arrangements (PTAs), trade defence measures, trade remedies and international sanctions, and which it must address before it can even begin to think about saving money and perhaps leveraging any advantages that may result from mastering all this complexity. Many colleagues already have it all figured out, or are at least a few steps ahead in this process. They may have had to deal with certain issues before you have, or they may have foreseen problems at an earlier stage. They may also have figured out solutions to them, or at least developed coping mechanisms. The main objective of the Journal is to bring this information to you on a monthly basis. Investment regulation – trade and investment go hand in hand, whether expressed through national restrictions such as the US Exon-Florio law or its Canadian counterpart; the growing network of bilateral investment treaties; or even China’s new law. These issues will continue to drive international business decision-making. 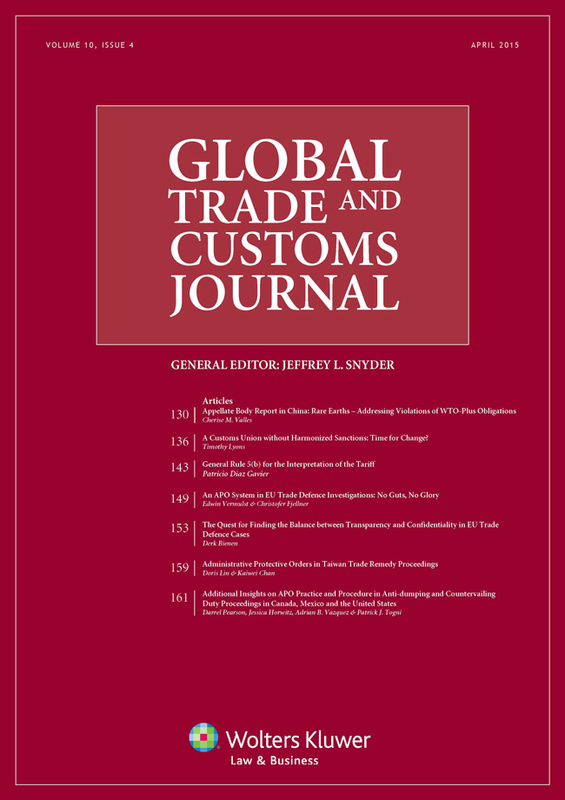 The GTCJ is a source for practical treatment of these issues, providing guidance based on experience and knowledge, including a focus on cross-border and multi-jurisdictional compliance issues, interviews with practitioners and others who wrestle with these matters, and other contributions that are designed to deliver a useful and timely package of information. In this age of what often seems to be excessive information, the GTCJ aims to provide a selection of contributions that is relevant to practitioners around the globe. Written for practitioners by practitioners, the Journal offers practical analysis, reliable guidance and experienced advice to support professionals in protecting their clients’ or organization’s compliance interests. The GTCJ publishing team cannot do it without you. They need your guidance and direction, and look forward to hearing from you. Should you be interested in contributing to the Journal, please contact the General Editor, Jeffrey L. Snyder, for further information, including details on the Authors Guide and House Style Guide, or visit the publisher’s website.